In 2006, an American traveller got chatting to children in an Argentinian village and discovered they had no shoes to protect their feet. He wanted to help. His idea was to donate one pair of shoes to a child in need, for every pair sold. He created his social enterprise company, TOMS, and since then has donated 75 million shoes to children in need, with sales also funding health, education and community development programmes in over 60 countries. According to the Santander 2017 State of Social Enterprise Report, the largest report of social enterprises in the UK, there has been an increase in social start-ups over the past 10 years, with a new generation of entrepreneurs starting out. There are now around 70,000 social enterprises in the UK and the statistics are impressive. Across the UK, social enterprises outperform traditional businesses in many areas, including innovation, start-up rates, growth in turnover, and business optimism. 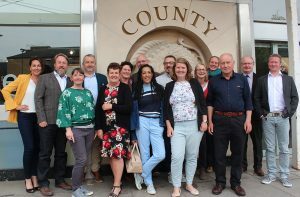 Somerset is no exception, and this May saw 15 of Somerset’s finest Social Entrepreneurs celebrating the successful completion of the Somerset Social Entrepreneurs Programme 2018, run by the School for Social Entrepreneurs Dartington (SSED). The day provided the invited audience, that included key players in the social enterprise network and representatives from business and public sector organisations in Somerset, with a real insight into the inspirational work of social entrepreneurs working throughout Somerset and the West Country. They are at the forefront of tackling some of society’s most pressing social ills. Mental health problems, hate crimes, prejudice, child protection, social exclusion, youth unemployment, rural isolation and environmental sustainability, to name just a few. The Somerset Social Entrepreneurs Programme 2018 is just one of a range of innovative courses delivered by the School for Social Entrepreneurs Dartington across Somerset and Devon. The courses range from short 8-day action-learning programmes such as this one, to year-long start-up, trade-up and scale-up programmes designed for innovators on different stages of their social entrepreneurial journey. The progression day event marked the end of the four-month intensive programme, during which participants benefitted from a stimulating action-learning environment. The students learnt ‘by doing’, gaining advice and guidance from business experts, participating in interactive sessions with experienced social entrepreneurs and fellow students and receiving individual in-depth analysis of their organisations. The highlight of the day was the pitching session. Each entrepreneur had just 3 minutes to pitch to the specially invited audience, who then voted to select the lucky recipient of a £2000 Enterprise Award. An increasing social problem in Somerset, according to Avon and Somerset Constabulary, is hate crime. Hate crimes against victims are motivated by prejudice or hostility to the person’s race or ethnicity, religion, sexual orientation, disability or gender. Nationally there were over 80,000 hate crimes reported in 2016/17, an increase of 29% from 2015/16. Somerset saw an increase from 88 reported incidents in 2015 to 148 in 2017. Deborah Badoo, founder of State of Trust, highlighted in her pitch, the isolation and mental health problems that many victims of hate crime suffer from. She described how State of Trust uses the arts as a therapeutic tool to bring communities together, working with refugee access centres in the South West. She cited evidence which found that arts intervention projects, like hers, can significantly reduce anxiety, depression and stress leading to reduced rates of hospital admissions, and money on police and court time. Another student, Berkerley Wilde, founder of The Diversity Trust, outlined his vision for: “…a society where prejudice, discrimination, abuse, harassment and hate is no longer in our society.” His mission is to create a safer, fairer society and his organisation works towards this by educating and training organisations ranging from small charities to multi-national corporations. He explained that as many as 80% of hate crimes go unreported and that through partnering with organisations and universities he aims to raise awareness of the problem and empower those affected. Mental health is another problem being tackled by the SSED social entrepreneurs. According to the charity, Mind, nationally 1 in 4 people suffer from a mental health problem every year. Somerset County Council statistics report 1 in 6, equating to 70,000 people in Somerset, will suffer from a mental health problem at any one time. 50% of mental health problems start by the age of 14 and one in ten children will experience a mental health problem. SSED student Kris Scotting, founder of Seed of Hope, is an ex-psychiatric nurse whose social enterprise provides recovery based social horticulture to change the lives of people with mental health problems. He provided two heart-warming examples of how his organisation has changed lives. First, a schizophrenic man who had lost all confidence because the voices in his head were so bad. With help from Seed of Hope he rediscovered his confidence and strengths and now has hope for a positive future. The second, a man who came to them unemployed and depressed. As a result of their intervention he is back in full-time work and planning his wedding. As well as telling the audience about the valuable work that their social enterprises are involved in, the students reflected on how much they had gained from the programme. Kris Scotting commented that the course had given him a great opportunity to pause and reflect on what Seed of Hope does and had shown him how to demonstrate the social value of his enterprise and communicate that with a wider audience. The range of social enterprises presented was impressive. The audience heard from enterprising students who are building community cohesion, reconnecting people with the natural environment, supporting adults living with brain injuries and working with vulnerable abused children. The £2,000 award was presented to Pearl Leyshon, for her social enterprise, Girl Friday, which matches workers in rural areas of Somerset with people who need work doing. Pearl commented: “Coming on the course has really helped me. I’d highly recommend it to anyone who is thinking of carrying on with an entrepreneurial business idea. It’s been a real pleasure and the £2,000 that we’ve won today will go towards helping access to learning for some of our micro-providers. The School for Social Entrepreneurs Dartington is part of the School for Social Entrepreneurs which has schools in the UK, Canada and India. They help over 1,000 people every year to tackle urgent social and environmental problems. The Somerset Social Entrepreneurs Programme 2018 is funded by the Enhance Social Enterprise programme (ERDF). The Heart of the South West Enhance Social Enterprise Programme is receiving funding from the England European Regional Development Fund (ERDF) as part of the European Structural and Investment Funds Growth Programme 2014-2020.